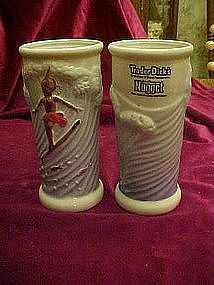 Hand painted ceramic drink glass from the famous Trader Dicks restaurant of John Ascuaga's Nugget. These glasses are glazed inside and out. Ocean wave around the entirety of the glass with a surfer riding the wave. Thes would be great for a tropical theme bar or kitchen. Measures 6 1/2" tall and is is perfect condition. I have 3 available. Price is for each. Picture shows front and back of glass.